January sale at the IPO: cut price fees for designs! Registered designs has often been described as the Cinderella right of the intellectual property world. Unloved, forgotten, neglected but hard working and with hidden beauty and value. When we asked designers what was wrong with the current UK design registration system they had three clear messages. Registered designs are too complex, too expensive and too difficult to enforce. Designers told us that the Victorian paper-based application process had no place in the 21st Century. So we worked with them to develop a brand new intuitive digital designs application service. We launched this in September last year, but we’ve continued to listen to feedback and have already made six improvements and added new features to the service to make the experience even better. The service is already very popular, with new requests to register a design up by 37% in the last quarter of 2015 compared to the same period in 2014. On enforcement you asked us why deliberate copying of your registered design wasn’t a criminal offence – like it is for trade marks and copyright infringement? So we introduced criminal sanctions for the intentional copying of registered designs in 2014 – so registering your designs is key. We’re still looking to improve the design system and you told us that the cost of applying to register your design and subsequent renewals was an issue for many designers. The fees for applying for a UK design were out of step with those at other national offices, such as Germany and France and also those for the Registered Community Design. You told us that you often only applied to register what you expected to be your best selling products in a range. You would like to register all of your designs – but the costs were prohibitive. Fashion designers also said that their collections may contain many different items and the current fee structure was a barrier to them protecting their creativity and innovation. As the memory of the new year sales starts to fade the IPO is having its own cut price bargain sale. Instead of a BOGOF offer, the IPO is asking designers what they think of radically revised fees for designs. 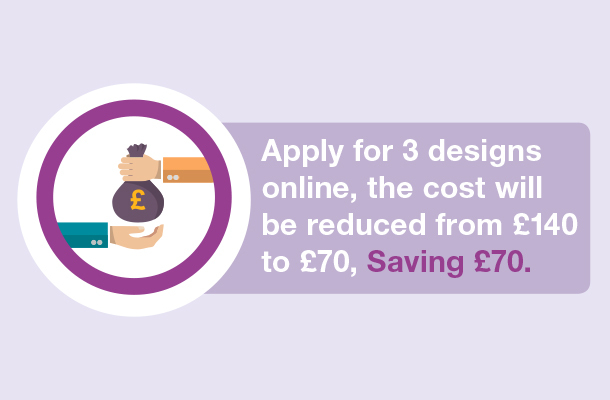 What do you think of a lower price for a single application to register your design? 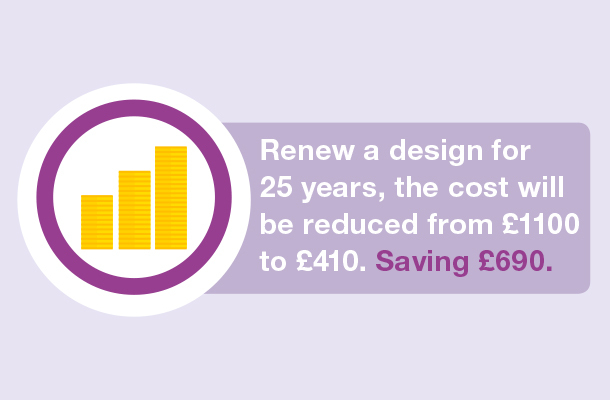 Or a “ significant reduction to register up to ten designs and lower costs to keep your registration in force? We know we still have some way to go in updating our designs services, but we’re committed to getting the very best system we can for UK designers. Tell us what you think about the proposed changes to the fees and we’re always happy to hear about any other ideas you may have about how to redesign our designs services! Thank you for reading and responding to the blog. We will be considering all responses to the consultation to changes to registered design fees and will issue a government response in due course. I am also aware you have now received correspondence from us. If the IPO/government was serious about helping UK small designers it would not be saying things like "out of step" with other countries, it would be saying "we are going to be the best in Europe on all levels!" What is £70 for 3 designs? A joke when someone is on a low income or just starting out. What if only one makes it through? And at £25 a pop per design to ask for a pre-search, really, just a joke. Make multi-tier costing for different size entities , micro, small and large, then the IPO can say they are changing things. To be offering to give a better price from a grossly overpriced service in the first place isn't such a great thing. It should only cost £10 non-refundable to do a search on one item and much better sliding-scale price if more than one is submitted at a time. If the answer is positive then the tenner goes towards the full cost of registration. A proposed £50 for one design, great for some I guess. I sent in the consultation with polite words detailing my thoughts of this subject etc.., did I get even an acknowledgement? No. I don't believe the IPO is really interested in helping designers at all, but certainly interested in fees. Can't scam them anymore at the high price, lets put it down a bit and get some income. Rip Off Britain it's best. Yes, I am angry because I want to register my designs but the risk is too financially high on my low income it they are not accepted. Make it fair for EVERYONE, not just those well off.